This technology is a revolution for stone quarry, which is highly efficiency in exploitation, safety and environmental friendly when operation. With this technology, the quarry will have a high yield of good block and the size of block will be large. With the promotion of this technology, the situation of high consumption of resource, low output, small size of block, danger, pollution can be hugely improved. · Change the diameter according to customer's request. · Offer diamond beads with different hardness (HRB95-105). · Offer diamond beads with different length. · We develop special rubber and the technology of vulcanization, make sure the diamond wire can work in most hard-working conditions. For granite quarry, the cables are in general fitting by injection of vulcanized rubber, the advantage is better adheres to the beads and support cable, which protect it better from the action of abrasive pastes. 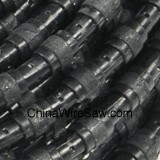 The rubber wire easily withstands increases in temperature caused by badly controlled water spraying is power 11-75KW. 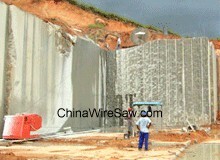 The water spraying between 25-50 L/min according to the cut dimension.